Over/Under: Under 153.5 at 1.90 Bet Now! 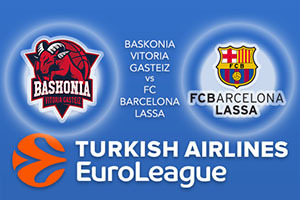 There is a domestic clash on Wednesday night in the Euroleague with Baskonia welcoming FC Barcelona Lassa to the Fernando Buesa Arena. The hosts have a much stronger record at this stage of the season, sitting with an 8-4 record while the away side carries a 5-7 record after 12 games. When these two sides clash in the Euroleague, things are often quite tight and after 12 games, the score is 6-6. The hosts are on a bit of a winning streak at the moment and they’ll think they can continue this run in this game. This is far from being the Barcelona of old and a domestic rival will be well aware of the fact that they have the upper hand coming into this game. When it comes to scoring, Baskonia have a record of 80.8 points per game, which is a full 10 points per game ahead of Barcelona, who only hold a 70.8 record. A key player for Baskonia has been Shane Larkin, who has provided an average of 14.3 points per game while Andrea Bargnani has also provided an average of 12.6 points per game, although he has been injured of late. Rodrigue Beaubois has provided an average of 11.8 points per game and he is likely to step in and add some power to the attack if Bargnani is absent. Injuries have certainly blighted Barcelona’s efforts this season with Tyrese Rice, on an average of 15.8 points per game being the only Catalan player who has reached double figures so far. Ante Tomic has notched an average of 8.1 points per game and Petter Koponen has provided an average of 7.6 points per game. The away team’s defence has offered up an average of 75.1 points per game and this is the best in the Euroleague. The hosts are the favourites for this game and you can take Baskonia Vitoria Gasteiz at -3, which is provided at odds of 1.90. Anyone looking for the Over/Under market will find that going UNDER 153.5 at odds of 1.90 is a smart bet. Bet Now!